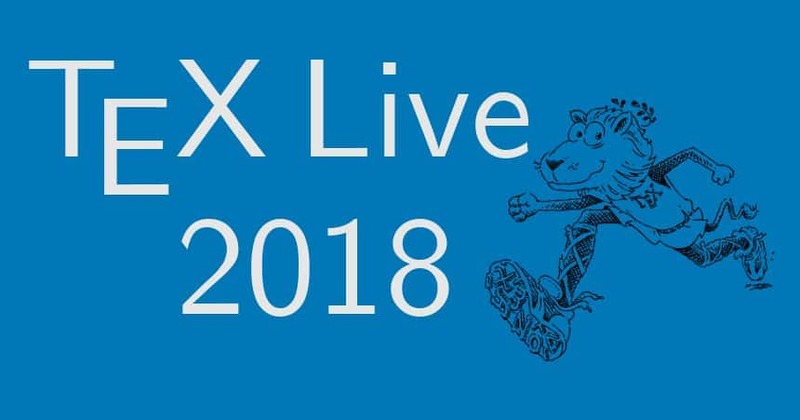 I guess everyone knows it already, Karl has released TeX Live 2018 officially just when I was off for some mountaineering, but perfectly in time for the current BachoTeX meeting. The DVDs are already being burnt and will soon be sent to the various TeX User groups who ordered. The .iso image is available on CTAN, and the net installer will pull all the newest stuff. Currently Karl is working on getting those packages updated during the freeze to the newest level in TeX Live. MacTEX: See version support changes below. In addition, the files installed in /Applications/TeX/ by MacTEX have been reorganized for greater clarity; now this location contains four GUI programs (BibDesk, LaTeXiT, TeX Live Utility, and TeXShop) at the top level and folders with additional utilities and documentation. tlmgr: new front-ends tlshell (Tcl/Tk) and tlcockpit (Java); JSON output; uninstall now a synonym for remove; new action/option print-platform-info. New: x86_64-linuxmusl and aarch64-linux. Removed: armel-linux, powerpc-linux. x86_64-darwin supports 10.10–10.13 (Yosemite, El Capitan, Sierra, and High Sierra). x86_64-darwinlegacy supports 10.6–10.10 (though x86_64-darwin is preferred for 10.10). All support for 10.5 (Leopard) is gone, that is, both the powerpc-darwin and i386-darwin platforms have been removed. Windows: XP is no longer supported. That’s all, let the fun begin!